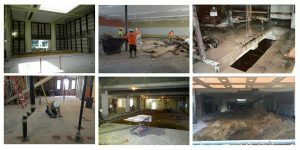 Our specialized selective interior demolition teams know how to work inside your building to neatly prepare your space for the next big change. Removing part of an existing structure requires highly skilled craftsmanship and the right tools. Very few companies in Florida have the level of experience that Great Southern Demolition does when it comes to partial deconstruction and selective interior demolition. Typical cases may include preparation for building additions, renovations, and building re-purposing. No matter the size of your demolition needs, let us help!